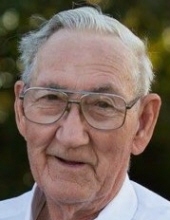 Edward Buel Newton, 88, of Hopkinsville, Kentucky died at 4:08 p.m., Tuesday, January 29, 2019. Funeral services will be held at 11:00 a.m., Friday, February 1, 2019 at Macedonia Baptist Church with Rev. Dale Ward and Rev. Barry Williams officiating. Burial will follow in Macedonia Baptist Church Cemetery. Visitation will be from 4:00 p.m. until 7:00 p.m. Thursday at Hughart, Beard & Giles Funeral Home. Hughart, Beard & Giles Funeral Home is in charge of arrangements. A native of Trigg County, Kentucky he was born on July 11, 1930 the son of the late Edward Haley Newton and Clemmie Maybelle Mathis Newton. On May 9, 1953 he married his wife, Wanna Sue Stone Newton who preceded him in death on June 23, 2015. He worked for the old International Shoe Company until it closed and was then employed as a custodian at Pembroke Elementary School. Mr. Newton was also a self-employed farmer and a member of Pleasant Green Baptist Church. Survivors include his sons: Edward Anthony (Sherri) Newton and Jeffrey Wayne (Sherry) Newton both of Hopkinsville, KY; his daughters, Connie Sue (Dale) Lisembee of Crofton, KY and Donna Lynn (Wayne) Finchum of Hopkinsville, KY; his grandchildren, Amanda Lisembee, Andrew Newton, Matthew Newton, Caleb Newton, Joshua Newton and Tammy Stevenson; his great grandchildren, Abby Harris, Zach Harris, Alyvia Newton, Brett Stallons, Drew Newton, Amanda Stokes, Cody Farmer and Colton Farmer; Several great great grandchildren. The family wishes to express their heartfelt thanks to Baptist Health Hospice for all their help. Memorials may take the form of donations to Macedonia Baptist Church Cemetery Fund, P.O. Box 240, Crofton, KY 42217. To plant a tree in memory of Edward Buel Newton, please visit our Tribute Store. "Email Address" would like to share the life celebration of Edward Buel Newton. Click on the "link" to go to share a favorite memory or leave a condolence message for the family.